I have put some new Artesano Humming Bird 4 Ply and DK in the shop. I am feeling much better today. The pain has not come back, not even after 2 glasses of wine last night. I think it must have been trapped air or something! Unscramble each of the clue words. Take the letters that appear in boxes and unscramble them for the final message. John has gone trout fishing as the part for the car did not arrive – it has to come from Germany and will not be here until the end of the week. Slip has not gone with him as he is going to take a boat and dogs are not allowed in boats. She is sulking as she hates being left behind. My eternity ring is ready for a fitting – we may go tomorrow. Better do my nails! Back tomorrow. Not feeling too good today. I woke up in the night with a gnawing pain behind my breastbone. I bought some Gaviscon tablets when I went shopping this morning and it does help if I chew them. But the pain comes back again. We took John’s car to have a part fitted this morning. The garage is at Hertford which is about 14 miles away. We had to leave it for 2 hours and so we walked into the town…..about 20 minutes in the searing heat. We walked along by the river which was nice – lots of baby ducks, geese and swans. Then we went into a pub by the river and I had a glass of wine…….pain immediately came back. I chewed more Gaviscon and it went away. We went back to collect the car….oh, no, they had ordered the wrong part. We have to go back again tomorrow. My brother telephoned and he and his wife are coming for coffee on Thursday morning on their way to visit some friends. I shall have to do a spider hunt before they come. I received some more Artesano Hummingbird today. I will put it in my shop tomorrow. I am going to have a bath now and then a glass of wine and see if the pain comes back! Answers to jannette@easynet.co.uk by Monday midnight please. I have been to the hairdresser this morning and done my grocery shopping. We having an Indian takeaway tonight and going to eat in the garden as it is a lovely day. England are playing Norway at football at 7.45 pm and so we shall eat before and then watch the game. Tomorrow I am cooking roast beef, roast potatoes, runner beans, butter beans and stuffed onions, followed by brandy snaps baskets filled with raspberries and cream. Got to go and make the baskets now. They are somewhat fiddly to do. I bake circles of the mixture and then shape them round the bottom of a jar whilst they are still malleable when they first come out of the oven. If I am not quick, they set before I have moulded them and I have to re-heat them! Here goes……..! 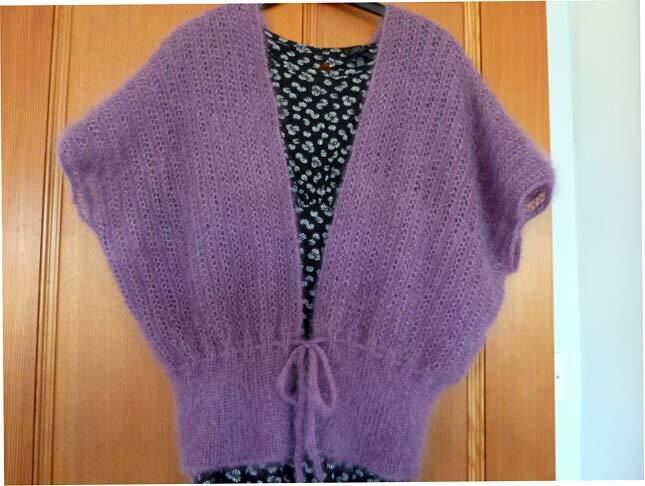 Here is my Ash cardi – it is not easy to photograph, it really needs a body inside! But I am pleased with it and will wear it over summer dresses. Speaking of summer, it is very warm here now. Yesterday we went to the seaside for a shellfish lunch. I had crab and John had cockles and shrimps. We took Slip which turned out to be a bad idea. We could not leave her in the car whilst we had lunch as it was too hot. We took her with us and were able to sit outside to eat but she was not a good dog – constantly on the lookout for any food going by and trying to scrounge from other diners. Today I put some scraps out for the birds – 2 tortillas, some red pepper and some potato wedges and, by the time, I had got back indoors, she had eaten the lot! Jackson is much better, back to his wicked self! He likes to stand in a big bowl of water that we have put in the garden for the two ducks that visit everyday. He stands in it and it comes up to his tummy, He is a strange cat! Nothing much else to report. Hairdressers tomorrow and maybe some new clothes – I shall see! I have finished my Ash Kidsilk Haze cardigan!! Ready to wear! I have started a new project. It is the Moss Stitch Jacket with Collar from Debbie Bliss Amalfi and I am using shade #16 which is a lightish denim blue. I like Amalfi -it has a nice dry feel. Yesterday afternoon Jackson suddenly started screaming and rolling on the floor tossing his head from side to side. He was pawing at his mouth and would not let me near him. This went on for about 10 minutes – it was horrible to watch. I knew that it meant he had eaten something which could not get down his restricted throat and it was hurting. It must have eventually gone down and he was quiet. What could he have eaten? A mouse? No, the truth was revealed when I went into the kitchen. I had cooked some pork shops for Slip and left them on the worktop to cool. One had been removed from the baking tray and a chunk was missing. Jackson had stolen it. I suppose he fancies meat and other goodies – his dry biscuits must get very boring. But anything else causes problems so dry biscuits it is! Nothing much to report on the yarn front. I am expecting some Addi Lace Needle sets with extra long points and also other needles. Also some Manos del Uruguay Lace yarns. I am going to take Slip out for a walk now as John has taken his car to have something done to the head gasket. Back tomorrow. Sorry I did not get back yesterday! Jacki, Theresa and Joan all solved the last puzzle. The answer is One swallow does not make a summer. 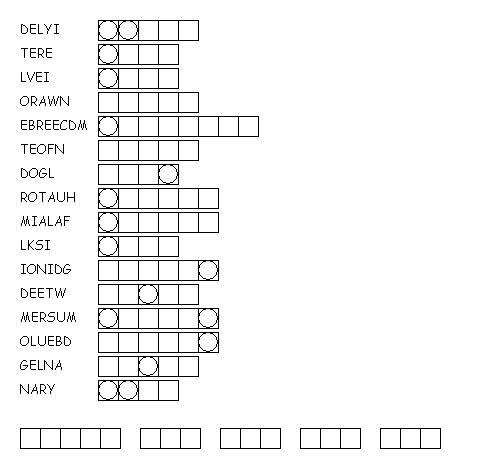 For the next round we will have a Fallen Phrase puzzle. A fallen phrase puzzle shows the spaces for a statement or phrase. The letters are directly below the column in which they will fit, but jumbled within the column. What does it say?! There are full stops that are shown in the correct places – sorry it is rather small. Answers to jannette@easynet.co.uk with Contest as subject line by midnight Wednesday please. Rowan’s Just Baby arrived today but not the Baby Merino Silk DK, it is due on June 4th. Other than that, I don’t think there will be much new until August. We are going to the fishing lake now to let Slip have a swim and so that I can see the Mandarin duck family. They are so cute. Jackson is in bed after some serious rabbit catching. I managed to rescue one and it hopped off OK. I shut Jackson inside so that he could not go after it, he watched from the window sill and yelled and yelled!! This design is from the new Noro Magazine that will be available from early June. We went to Smith’s last night. I had mussels in the half shell that had been covered with garlic and breadcrumbs and grilled. John had a crab! Then I had jumbo prawns with a chilli dressing and John had a filet steak. He also had chips and cauliflower cheese and I had dauphinoise potatoes. To be honest, the starter would have been enough for me – I had a job to get through the prawns but forced them down as they were expensive and John would have grumbled if I had left any. It was not a wonderful evening – a bit flat somehow. Often when I look forward to things, they do not come up to expectations – sometimes doing things off the cuff is nicer! I have to check the contest entries now – I will try to come back later but we have visitors this afternoon and so I may not get chance to update until tomorrow.